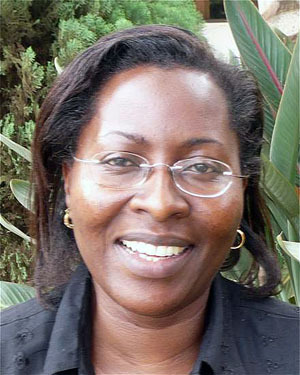 Dr. Sarah Kiguli is Senior Lecturer and Acting Head of the Department of Paediatrics and Child Health at Makerere University in Uganda. This edited, abridged interview is based on a conversation with Dr. Kiguli in September 2007 at the Network: TUFH meeting in Uganda, as well as email exchanges in 2008. When you were a little girl did you know that you wanted to be a doctor? Not really. My mother was a teacher, so I thought I would probably be a teacher. But when I went to Gayaza High School, one of the best and oldest girls’ schools in Uganda, I excelled in the sciences, so I thought of medical school. Why medicine rather than another branch of the sciences? I thought that if I trained as a doctor, maybe I could make a difference. I remember as a child waiting for many hours in a long line in a hospital. I thought maybe if I was a doctor, I could help this situation. You went to Makerere University Medical School not long after the regime of Idi Amin. What was your medical education like in the wake of his regime? The university was recovering. It was also the time of the liberation war before the current government was in power. There was a scarcity of drugs and supplies. But the teachers were available. The training was okay, it was a traditional curriculum with lectures. The basic sciences were in the first two years, and the clinical clerkships were in the last three years in the teaching hospital. There were hardly any community clerkships at that time. After five years, we had one year of internship that was hospital-based. I did my internship in Mulago – a tertiary hospital. Where I trained is where I now work. Did the scarcity of resources affect your work at Mulago Hospital? Yes, even now patients sometimes have to buy drugs on their own, but I think it was more of a problem then. After my internship I worked as a general medical doctor, still in Mulago, for almost two years. Then I started three years of postgraduate training in pediatrics. It was a choice I didn’t have to think about. I liked the children and the mothers. Children are special. When they are unwell, they are sad. When they are better, they smile. They are very honest. I thought working in pediatrics would be satisfying. After the postgraduate training I continued working at Mulago Hospital, and I joined Makerere University as a lecturer. I was married and had a child. There was a chance that I would be posted up country, so I opted to work for the university. But a deeper reason for becoming a lecturer was that as a resident I was involved in teaching medical students, and I loved it. What did you love about teaching? The challenge. As a medical student I remember being timid when no one was available to help me in the wards. As a resident I looked for these kinds of students, so I could give them an opportunity to learn. I was able to be there for them because I know that it can be a bit frightening if there’s no one to help you. I was also given the responsibility of coordinating the pediatric training of the undergraduate students. Classroom teaching. Making the teaching program for the students. Helping to organize exams. When you designed the curriculum, did you want to make any changes from the traditional curriculum? Even then I wanted standards to help us in assessing the students. I wanted all of us to have something to look at as we examined the students to make our evaluations more objective. I tried to introduce new topics that I thought were more relevant. Most of what I suggested was out of instinct. I was always looking out for the students. At meetings I would speak up for the students. Its sounds like you were student-focused as opposed to subject-focused. You stood in your students’ shoes and tried to think, from their point of view, what would be most helpful for them. Yes, the way I teach is to always ask students questions as opposed to giving them information. I always challenge them to think. I noticed that the students in my firm did very well in my area. Some of them came back for postgraduate training in pediatrics. Did you have any teachers who were role models for your strategy of asking rather than telling? During my internship, Dr. Byaraguba Justice encouraged me to think, as opposed to telling me what to do. I noticed that some of my colleagues’ supervisors were doing just the opposite. So I became a bit like my teacher. The head of the department, Dr. Gelasius Mukasa, gave me a lot of responsibilities. After I had qualified as a pediatrician, he would sometimes ask me to act as head of the department. Around 2000 I was appointed to the education committee of the faculty of medicine. Associate Professor Sam Luboga, our new deputy dean of education for the faculty of medicine, visited our departments and asked what our teaching challenges were. That helped us think about what we were doing. We asked the teachers, “What do you teach? What do you like about it? What can be changed?” The students said that they did a lot of basic sciences in the early years but later on didn’t see the relevance of these sciences. The employers said that our students had good clinical skills, like taking a history, but that they had trouble solving problems and communicating with patients. In addition, the employers said that students needed management skills. Like the employers, the patients told us that some students had problems with communication. We asked ourselves how we could meet these needs. One day the deputy dean found the website of Maastricht University. He communicated with Maastricht. Two people from Maastricht visited us. They told us what they did and what we might be able to do to improve our program. A few months later (in the summer of 2002) four of us from our faculty had the opportunity to go to Maastricht University for a summer course in problem-based learning. I was also introduced to some things in clinical skills training that I had been doing, but I had never been trained for. When we returned, the dean, Professor Nelson Sewankambo, asked, “Based on the training you have gone through, can you propose some changes that we can implement to improve the training of our students?” Our group became the curriculum committee, but before we could recommend changes we needed more input. The people at Maastricht put us in touch with people in the faculty of medicine at Moi University in Kenya. In September that year (2002), I went to Moi University where I attended my first Network: TUFH annual meeting. What steps did you take after the Network meeting? Initially we met as the curriculum committee. Then we engaged the faculty. We came up with a new problem-based curriculum that was implemented a year later in 2003. We were learning as we planned. We thought we’d never have enough resources. Was your dean behind the changes? Yes, Professor Nelson Sewankambo supported us, but he wanted the committee to do the work so people would not say that it was his curriculum. He wanted the faculty to own the curriculum? What were some of the steps that you took in developing and implementing the curriculum? While we were developing the curriculum, we made a proposal to the Dutch government to help us in building the capacity of our teachers and ourselves so we could implement the innovations. That proposal was successful. We were given the opportunity for six people to do a master’s program in health professions education. We also needed experts from the Netherlands and other countries to come to our medical school and facilitate courses for the bigger pool of teachers. We wanted to focus on issues, such as PBL, assessment, skills training and, in general, how people learn. Did experts provide this faculty development at your school? Yes, the experts provided the faculty development. We had several training workshops. The workshops focused on problem-based learning, curriculum development, course design, problem writing, the tutorial process, assessment and other topics. Weren’t you one of the six people who did a master’s program at Maastricht? Yes, I completed the program in June 2007. Congratulations! Didn’t you also do the FAIMER [Foundation for Advancement of International Medical Education and Research] fellowship program? Yes, I did the fellowship in advanced leadership, medical education and research from October 2004 until October 2005. The fellowship required that you write a proposal for a curriculum change project. I chose the area that was disturbing us the most at the time – skills training. We didn’t have a skills lab. We had no curriculum. So my project was introducing clinical skills training program for the students. A few months after I started the FAIMER fellowship, I learned that the Dutch government was going to support the master’s program, so I started that program as well. You were getting intensive crash courses in medical education. Yes, the courses complemented each other. What I appreciated most at FAIMER was the training in leadership skills, change management, program evaluation, and how to work in teams. These were skills that we hadn’t learned in our medical education but we needed these skills if our new curriculum was to be successful. Did you learn any important lessons about the change process? I realized that sometimes our curriculum committee didn’t listen well enough to other people. If I had it to do over, I would have involved others more and showed them that I was listening to their concerns and addressing their concerns. Didn’t the feasibility study, which you and your colleagues undertook, involve most of the major players – students, faculty, patients, employers? Yes, but there were many other people who wanted to be reached, and we couldn’t reach all of them during that process. Some people probably thought they were being left behind. Some might have not wanted the change because they didn’t understand it and because they thought they weren’t involved from the beginning. I think that those of us who had passion for medical education and were committed to seeing change selected ourselves for the curriculum committee. After a while, some people started asking, “Who appointed these people?” We had no mandate, just passion. Hadn’t the dean invited you to be on the committee? Yes, he did, but maybe people wanted the faculty board to endorse his decisions. The faculty board decided they would select different people who would lead the change, so different committees were selected. The curriculum committee was sort of dispersed. But then I was given a new responsibility of being the education coordinator. This was difficult because I didn’t have a curriculum committee. Now people are realizing the importance of having a committee. I think in the future a committee or a unit might be established to coordinate what we are doing. The work of educational coordinator is too much for one person. I finished my FAIMER fellowship in 2005. From 2005 to 2006 I was a faculty advisor for FAIMER, mentoring some of their new fellows. I was also completing my master’s program and being the education coordinator. I graduated from the master’s program in June. I’ve spent a year helping to organize the 2007 Network: TUFH meeting here in Kampala. You’ve had a lot on your plate! This year I also started acting as the head of the department of pediatrics. Now I have to decide whether I stay in pediatrics or education. As the new curriculum begins to be implemented in the clinical years, we have to prepare for this. I can see myself playing that role as the chair in pediatrics. On the other hand, I see myself as a leader in education. I’ll probably have to move from the department of pediatrics to be one of the people coordinating the overall educational program. Recently we had elections for the deputy dean of education. A few people wanted me to be nominated. They also wanted to nominate a person I had worked closely with on the curriculum committee. I thought it wasn’t good to divide ourselves, so I didn’t accept the nomination. Eventually I would like to accept this responsibility. They haven’t yet had a woman dean or deputy dean at Makerere. Women are in the minority in leadership positions at your school. What has it been like for you as a woman to try to bring about change? It seems like you have to work a bit harder as a woman. And the men challenge and oppose you more. We women think differently than men. Women want to have consensus. We want to listen to people. The men want to follow the rules. At this time, though, not all of the women support the women. We need to develop a strategy to support and work with each other. Being a woman in a leadership role is also challenging because the men want to meet in the evening or on the weekends when women have to be home. We have to take care of the family as well as our work responsibilities. How have you been balancing your family and work responsibilities? I organize myself. I go to work early. I try to do a lot when I’m at work. I make a deliberate effort to give quality time to my family when I’m at home. Sometimes I have to do assignments at home. That doesn’t go over very well with the family, but they appreciate what I’m going through. Is your husband in the health professions? No, he works with the parliament of Uganda. He’s the editor of the Hansard, (the parliamentary proceedings). Are you children thinking about the careers they would like to pursue? My daughter first thought she’d be a doctor, like mummy, but she likes French and English literature, so maybe she’ll take after her father. My son initially wanted to be a doctor, but now he wants to be an engineer. He’s at the age when everything is exciting. What other steps do you plan to take in building your career? I want to go beyond the master’s degree in health professions education. But as much as I love medical education, I can’t make progress in my career unless I have some publications in pediatrics. So I’ve done research in child health, and I supervise residents both in their research and their clinical work. The university didn’t prepare us to do research and write papers and yet research is the main area considered for promotion. We are advocating for the university to also consider other things that we do. Does research in medical education count? I have the feeling that it won’t count that much, particularly if a pediatrician reviews it. So I’m working on innovations in pediatric education. My master’s thesis was on what mothers of sick children want and expect in the doctor patient communication. I’d like to do more research in that area. I’d like to design a curriculum based on the patients’ needs and then see if the students who go through this program have the skills that are needed to address the patients’ needs. What are some of your goals for the curriculum at your school? Most of the faculty are being trained. We’re trying to make the program better and better. The students who started with the new curriculum are in their final year. We’re trying to introduce a bit of case-based learning in the clinical years. We want to use the inquiry process as the entry point to learning. Your clinical education at Makerere was hospital-based. To what extent, if any, do current medical students work and learn in the community? We now have a new curriculum that is problem-based and community-based. The students spend four to six weeks each year learning and working in the community. They are exposed to the health facilities and the environment as well as the people in the community. What are your hopes for the ways in which your graduates can contribute to improving the health of the people of Uganda? Because our students are learning and working in the community, even as students they can do a lot, especially in the area of health promotion and disease prevention. As graduates they are capable of identifying and helping to address the health needs of communities, and they have the skills needed to work effectively in community health facilities. That’s good to hear. Thank you for sharing your experiences. Best wishes with your important work.